An article that I just wrote with that title, dealing with avoiding lawsuits, has just been published in the September/October issue of Common Ground magazine. Members of CAI can read the article here. Nonmembers of CAI can join here. 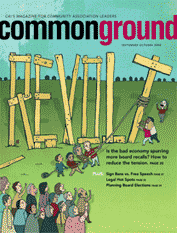 Or, you can get a subscription to Common Ground here. Then again, if you’d rather hear about how to avoid lawsuits, you can keep an eye out for courses at our Community Learning Center, where we’ll cover this material, and more, over the next several months.